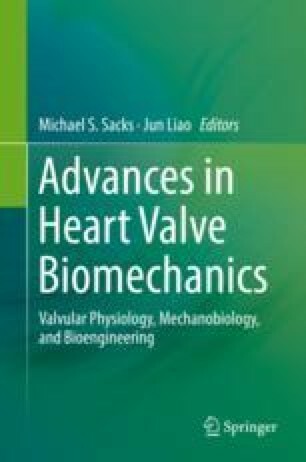 This paper builds on a recently developed computationally tractable material model merged with an immersogeometric fluid–structure interaction methodology for bioprosthetic heart valve modeling and simulation. Our main objective is to enable improved application of the use of exogenous crosslinked tissues in prosthesis design through computational methods by utilizing physically realistic constitutive models. To enhance constitutive modeling, valve leaflets are modeled with a computationally efficient phenomenological constitutive relation stemmed from a full structural model to explore the influence of incorporating a high-fidelity material model for the leaflets. We call this phenomenological version as the effective model. This effective model constitutive form is incorporated in the context of the isogeometric analysis to develop an efficient fluid–structure interaction method for thin shell structure of the leaflet tissues. The implementation is supported by representative simulations showing the applicability and usefulness of our effective material model in heart valve simulation framework. This work was supported by the National Heart, Lung, and Blood Institute of the National Institutes of Health under award number R01HL129077. The author Rana Zakerzadeh is partially supported by ICES Postdoctoral Fellowship. We thank the Texas Advanced Computing Center (TACC) at the University of Texas at Austin for providing HPC resources that have contributed to the research results reported in this paper.